Steve, GW4BLE, operated single band 75 meters. You can listen to your QSO with him at www.gw4ble.dxlist.co.uk. 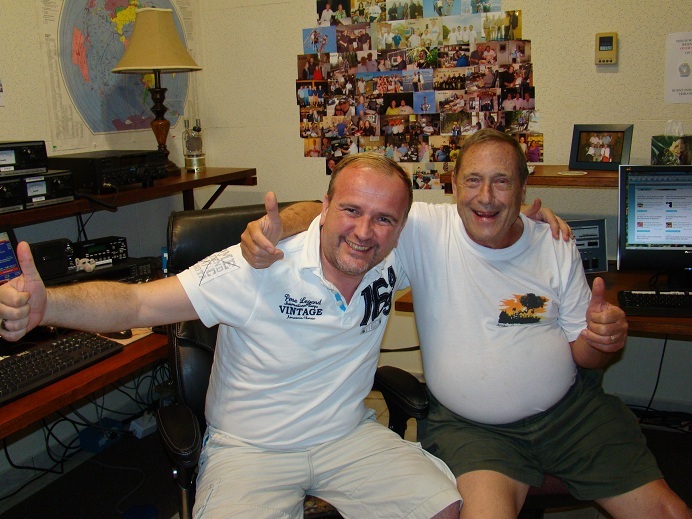 Helmut, DF7ZS (left), and Carl, AI6V/P49V, are showing the spirit of ham radio contesters worldwide. EE8Z (op NP4Z) was omitted from the Tribander/Single-Element overlay category. There were two errors in the award list. RA3AKT had two Yellow Cards in CQWW 2010 and this makes him ineligible for an award in WPX 2012. Winner of the Rookie plaque is S59ABC.